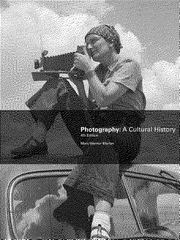 Photography 4 Edition A richer, more kaleidoscopic account of the history of photography Incorporating the latest research and international uses of photography, Photography: A Cultural History, 4/e surveys the history of photography in such a way that students can gauge the medium's multifold developments and see the historical and cultural contexts in which photographers lived and worked. Mary Marien’s comprehensive survey shows how photography has sharpened, if not altered forever, our perception of the world. It provides a unique focus on contemporary photo-based work and electronic media. The book was written to introduce students to photography, requiring no previous technical knowledge of photography. The fourth edition has been revised to include new material and to expand topics that have received recent scholarly and public attention. Material on the history of photography in China, ranging from the nineteenth century to the present, has been added throughout the new edition. For the first time, adopting instructors may receive access to a PowerPoint set containing many images from the book.